Book Expo America (BEA) is a pretty big deal in the publishing world. Many book bloggers are attending the event in NYC this week. For those of us not attending there's Armchair BEA. And rhubarb cake. Staying home has its benefits. We picked the rhubarb at my grandparents' farm. That's my grandparents' garden pictured in the header. We try to visit the farm as often as possible. In fact, I much prefer the country to the city, and I'm not altogether sure I'd enjoy BEA even if I had the chance to attend. NYC is a little too big for my liking. Plus, I imagine that trying to find rhubarb is a little tricky in the city. Did you know that when you harvest rhubarb you shouldn't cut it off with a knife? You just gently twist and pull the stems off at the base of the plant. ... and making rhubarb cake. I used the "Rhubarb Cake I" recipe from allrecipes and made the following alterations -- I used three cups of rhubarb instead of two and only one cup of white sugar instead of 1-1/2 cups. 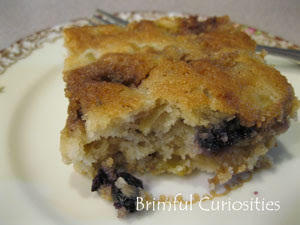 We also added a handful of blueberries to our batter. The rhubarb flavor is subtle, not at all tart and the cake is very moist. The kids even like to eat it, especially with a little ice cream or whipped cream! There aren't many children's books about rhubarb. Rhubarb pie makes an appearance in Elizabeth Enright's Then There Were Five. Mona tries her hand at making it, but she forgets to add sugar! Yuck. In Patricia Polacco's autobiographical picture book about her childhood and relationship with her brother, My Rotten Redheaded Older Brother, the two siblings have a little contest eating raw rhubarb. Yuck again! I think I'll stick to rhubarb cake. It sounds like you keep very busy between the kids, the gardening and the blog! i've never had rhubarb cake before, but it looks delicious! i'll have to try out the recipe sometime. I haven't tasted rhubarb in ages! My mother grew it in her garden and made the best rhubarb pie. I have never tried rhubarb in any form! Cake is generally superior to pie, in my estimation, so I think your rhubarb cake sounds fabulous! Yum. Lovely blog- so glad to come across it via Armchair BEA. I am a mom to two young ones, so I always enjoy children's book reviews. I was a children's librarian for a few years, but since moving on to teen librarianship, I'm much more current with YA than kidlit. So your reviews will be very helpful to me! I'll admit - a complete disgust for rhubarb on the part of my father has made me cautious about ever trying it, but your cake looks delicious! I never heard of rhubarb before. Now I want to try some in a cake or a pie. Cute post! 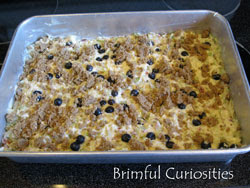 the rhubarb cake looks wonderful :-) Nice to meet you, too! Yum, the rhubarb cake sounds fantastic. 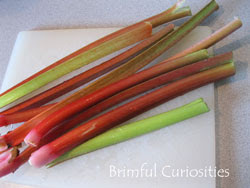 Will have to get my hands on some rhubarb and make some. I love how you are spending your week. While I would actually love to attend BEA, your list of weekly activities is the primary reason why it will be a long time before I am at BEA; children, family, and life activities.